I’ve got a theme going on for St. Patrick’s Day this year. So far everything I’ve made has been a garland! 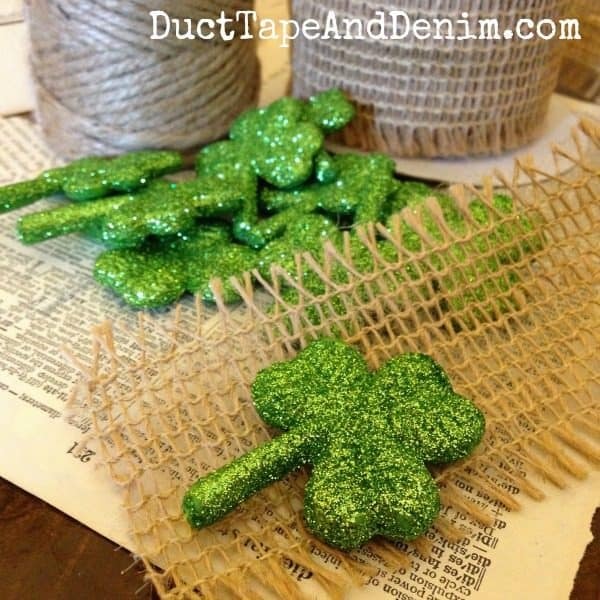 This glitter shamrock garland came about a couple of years ago when I found out that JoAnn Fabric was going to be a sponsor for SnapConf 2015. I was so excited because JoAnn is one of my favorite places to shop. (And, BTW, was also one of my first employers WAY back in my college days.) I had a couple of free hours so I went there to just walk up and down the aisles for inspiration. That’s when the glitter on these shamrocks caught my eye. that Feliz gave me when we were loading up at the last Antique Alley. Hot glue is holding everything together so it’s a pretty easy project. My collection of vintage ‘stuff’ just keeps growing and growing! Yes, that 1980s photo is part of my vintage ‘stuff’. 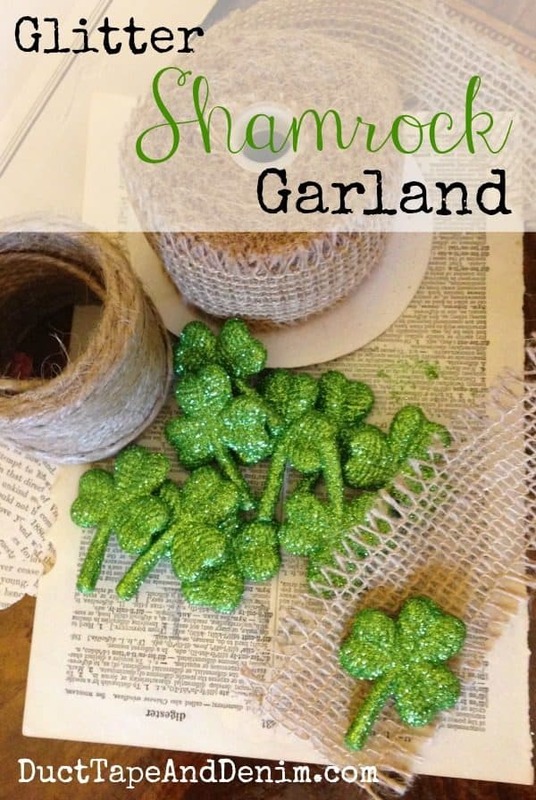 Leave a comment and let me know if you’ve made a garland for St. Patrick’s Day! Oh how cute! I love how this turned out! Your shamrock garland is adorable! Super cute and clever! Thank you so much for linking up with us at Something To Talk About! Adorable! Thanks for sharing it at the Vintage Inspiration Party! What a great and simple project Ann! Those shamrocks are really nice but what you did with them is super cute. No one wants to invest much in holidays like St. Pats, so this is the perfect moment…low cost, low time and high impact for a couple of weeks. Thanks for bringing this to the St. Patrick’s Day Link Party! This is such a cute garland. It’s so simple and yet so effective in the way that you staged the garland in the picture frame. 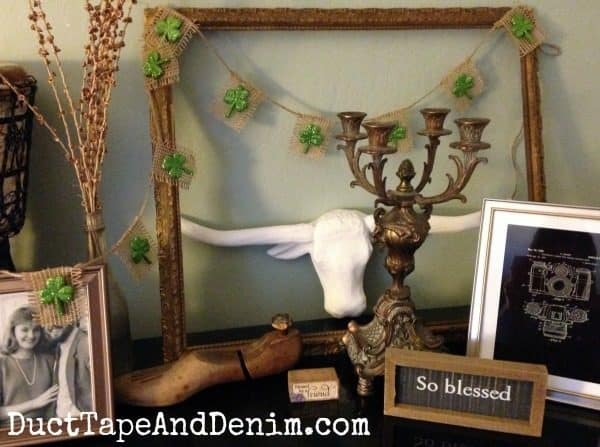 Great addition to your St. Patrick’s Day vignette! Cute and festive! Thank you for sharing at Dishing It & Digging It! I adore your garland! 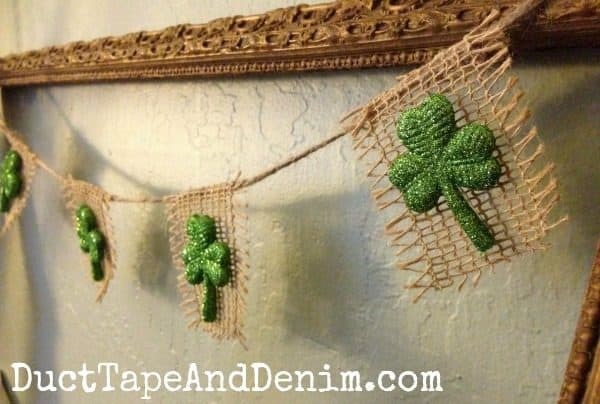 Such a fab St. Patty’s Day decor! Thanks for sharing your crafty inspiration on this week’s Monday Funday Party! Your garland is very cute. I love that burlapish look! Cute! Thanks for sharing at the To Grandma’s House We Go DIY, Crafts, Recipes and More Wednesday Link Party! Have a great week and join us again! Hello! I just wanted to let you know you are a feature on my blog this week for Thursday Favorite Things! I love this little garland! I am going to make a similar one. You should take a look at the garland I shared in my Early Spring Home Tour. It has been very popular with my readers. I got it at Hobby Lobby but I know you could make one! I hope you will come over and say hello and party with us again this week. Happy Spring!